Hello Friends! Are looking for a Government job then, you can try for WB ESIC Recruitment 2019. The (ESIC) Employees State Insurance Corporation is going to conduct a recruitment exam of the ESIC West Bengal Recruitment 2019 with its recently issued notification; it is going to offer a cool chance to many eligible and interested candidates who desire the job of Govt. sectors and is the resident of India. 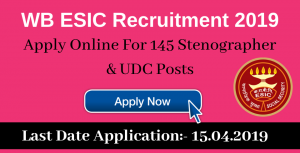 The (ESIC) Employee State Insurance Corporation through its recruitment exam of the WB ESIC Recruitment 2019 is going to recruit many eligible & interested candidates for total 145 posts of Stenographer & UDC (Upper Division Clerk). Have to be a higher secondary pass (12th standard pass) or its equivalent from any recognized Board/University. Candidates are required having a typing speed of ‘80 words’ per minute in stenography in English/Hindi. Candidates should have a good working knowledge of Computer along with the use of Office Suites & databases. Should have a degree from a recognized University/Board or its equivalent. It is necessary to have a working knowledge of computer along with the use of office suites & databases as well. Payment will be revised in accordance with the 7th Central Pay Commission for the post Level- 4 (Civilian employees) along with the entry level Payment of ₹25500, is replaced against the pay band of ₹5200/– ₹20200/- along with the grade pay of ₹2400/- as per the 6th Central Pay Commission. The fee of ₹250, for above-mentioned reserved categories, shall be refundable duly after deducting the Bank Charges as applicable by the ESIC Commission, during the appearing of the candidate in the Phase – I Written Examination. The fee payment has to make through Debit Cards (Visa/Master Card/Rupay/ Maestro), Credit Card, Mobile Wallets, IMPS Cash Cards, and Internet Banking etc. Selection will be on the basis of both Written Test & Interview. The marks obtained in the Phase-I of the Main Written examination will be considered for the final selection. For every wrong answer, negative marking is kept of ¼th. The candidates will be shortlisted on the performance basis of the phase-II in the ratio of 1:10, which is around 10 times in the number of vacancies in each category and on the basis of the performance in Phase-I. For Computer Skill Test in the Stenography, the speed should be 80 words per minute in English or Hindi and transcription of the same in the computer for one hour. For the Stenography test, candidates will get 10 minutes. The VH candidates will be required to transcribe the matter within 85 minutes for English Shorthand & within 95 minutes for Hindi Shorthand. The working knowledge of the PWD (Person With Disability) candidates shall be evaluated on the basis of Objective Type Questioned on Computer for 50 marks and for 50 questions without any negative marking. Computer Skill and The Stenography Test will be decided and qualified in nature. In the preliminary examination of the UDC for each answer, there will be a negative marking of 1/4th. In the preliminary examination of the Phase-I candidates will be shortlisted on the basis of the ratio of 1:10, which is 10 times the number of vacancies in each category and on the performance of Phase-I. The marks are secured in the Phase-II will be counted for final selection. From Phase-II, the candidates will be shortlisted for Phase-III as per the ratio of 1:5, which is about the 5 times of the total no. of vacancies in each category & on the basis of the performance of Phase-II. For the selection of the UDC (upper Division of Clerk, the working knowledge of the PWD candidates shall be evaluated on the basis of Objective type Question on Computer. The total test is of 50 marks and of 50 questions, has no negative marking. Computer skill test will be evaluated and qualified on the basis of nature. Such candidates will not be reckoned on the basis of merit ranking. Before applying, Online Applicants should have a valid email &scanned copies of photo, signature etc. for filing the application quickly without any delaying. Then, have to go to “Recruitments” link. Here, have to read the information carefully & have to click on the “Apply Online” button. Then have to click on the link of “Click here for New Registration”, in case a candidate is a new user. Here, have to complete the Registration & and then have to Click on the “Submit” tab. After completing the Registration, have to Log in with Registered Number & Password. Then, have to start filling all details in the application form&also have to upload Photo & Signature. Application fee has to be pay through online mode only before submitting the Form. Finally, have to take a print out of the online application for future requirement just as during examination & interview if is needed.